I don't even know if it's even necessary to post a recipe but if it helps, I'll include the recipe for a spicy guacamole you can use in the sandwich (or just with chips if you prefer!) 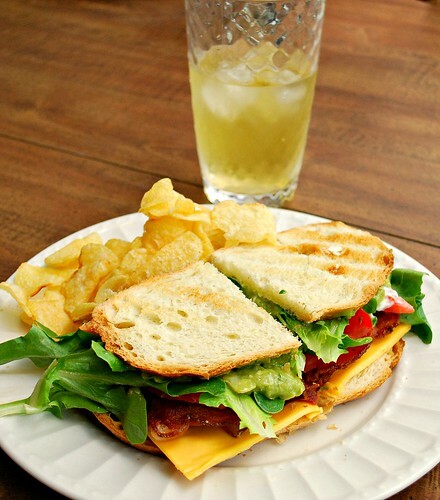 For BLT sandwiches I prefer thick cut bacon - a lots of it - so that you get that bacon in every bite. The lettuce can be whatever you prefer. I ended up using some artisan lettuce which was had a subtle sweetness. Tomatoes are a must and I love using heirloom tomatoes when available. In this case, I used some sweet roma tomatoes that did the job. We can't forget about the cheese! Cheddar cheese is what I had on hand but feel free to use whatever you prefer - cheddar, american, pepper jack, etc. I used gluten free Udi's white sandwich bread, but for those non-gluten free folks, any good loaf bread works well. My boys enjoyed their sandwiches made with a round Italian sliced loaf that toasted up nicely. Let's talk condiments - we love mayo so we slathered some on the inside of one slice of bread. 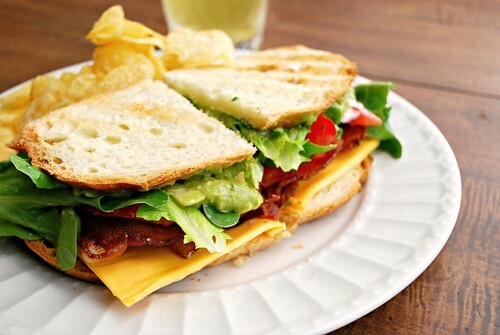 The mayo worked harmoniously with the spicy guacamole that we slathered on the other slice of bread... and when all combined, you'll have yourself a Baja BLT sandwich! Place avocados in a medium bowl, and mash roughly with a fork. Add the remaining ingredients and mash to desired consistency. Stir in chopped fresh cilantro.